So, you want to know how to stencil? That's a question that could lead you into an addicting hobby that will bring you hours of joy and pride in the art that will flow from your hands. Great! Let's get started. Never stenciled before? You can do this! It's fun and easy! And you don’t have to be a da Vinci to paint stencils. Just follow these steps and then line up a project. I guarantee when you sit back and admire your handy work you will be hooked. These instructions assume that you are a beginner because I don’t want to leave anyone behind. I truly believe that if you have an interest, you can create art with stencils. I hope to inspire and motivate as many people as possible to do just that. 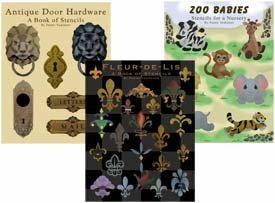 However, if you have used stencils and are just looking for some new techniques or ideas, this site has something for you too. So, you may want to jump ahead to the tips about painting stencils with shadows and highlights to give them a more hand painted look. Ready? The next four paragraphs will give you the details to fill you in on exactly how to stencil. Click on each link in order and don’t be tempted to skip ahead because if you do you'll miss out on valuable information that is provided here to help you create a masterpiece. First things first! You need to have the right stuff handy before getting started. I've created a Stencil Supplies Checklist for you. This section includes an extensive discussion on different supplies and tools to help you find what will work best for you! Then, of course, you need to have a plan. For example, where are you going to put your stenciled images? What colors are you going to work with? This page has all the tips you need to plan and prepare before you Paint Stencil patterns on your surface. OK! Let's Paint! Finally, it’s what you've been waiting for. It’s time to paint. There are some techniques for Stencil Painting that you need to know like how to apply the paint to get clean lines. Well, since this is such an important part of your how to stencil success I made a video of Stenciling Instructions for you to follow along and watch as I apply paint to a stencil which includes some tips on working with Free Printable Stencils that can be found throughout this site. And if that's not enough there's more ideas at Basic Stenciling Techniques. How to stencil doesn't end with the basics though. 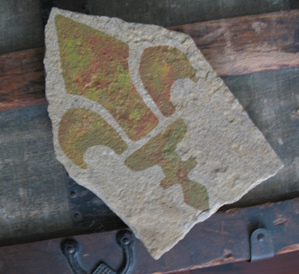 Now you'll want to know how to make a stenciled image look hand painted. Well, even though stencils are designed to produce the same image again and again there are many ways of Painting Stencils to add a personal touch. Now that you've learned how to stencil by just pushing paint through the openings, you need to pick up on a few more ideas for making your stencil have the right look like this little tiger. From there the sky is the limit and by that I mean that you'll be looking to design your own stencil. For that you can get all you need to know at How To Make A Stencil including single layer designs and multi-overlay stencils for much more detail. The last idea I want to share with you here is about using the stencil in the negative (applying paint to all the areas outside of the image). This opens up many ways of stenciling. To learn more check out Stencil Mask! We are thrilled to introduce our selection of Printable Stencils. Instant gratification at its finest! You don't need a special printer - these designs are specially formatted to print from your home computer on standard letter sized paper. Once downloaded, you will have your complete stencil booklet with patterns and instructions. Just click, buy and print! Well, I sure hope that you are sitting back and enjoying your artwork right now! I hope you see that with a little work and patience, stenciling can provide you with a great amount of enjoyment. It's my goal with this web site to motivate and inspire you to create your own art with stencils! Thank you so much for visiting and come back often. Return to Home Page from How To Stencil. Return to Stencil Patterns from How To Stencil.